MARCH 25, 2019. BY LODI WINEGRAPE COMMISSION. 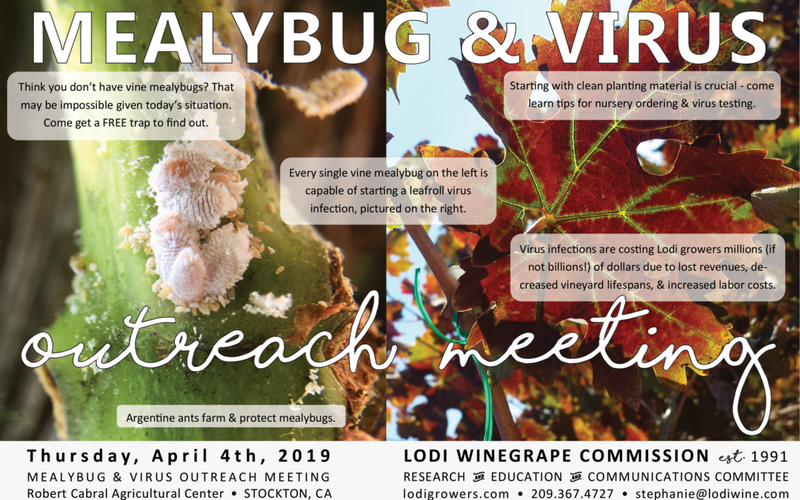 Please join your fellow Lodi growers, PCAs, and others on Thursday, April 4th, 2019 for the MEALYBUG & VIRUS OUTREACH MEETING! Be sure to RSVP (details below) as lunch is provided. Everyone is welcome. Grapevine viruses are expensive, complicated, and confusing, but HELP is on the way. 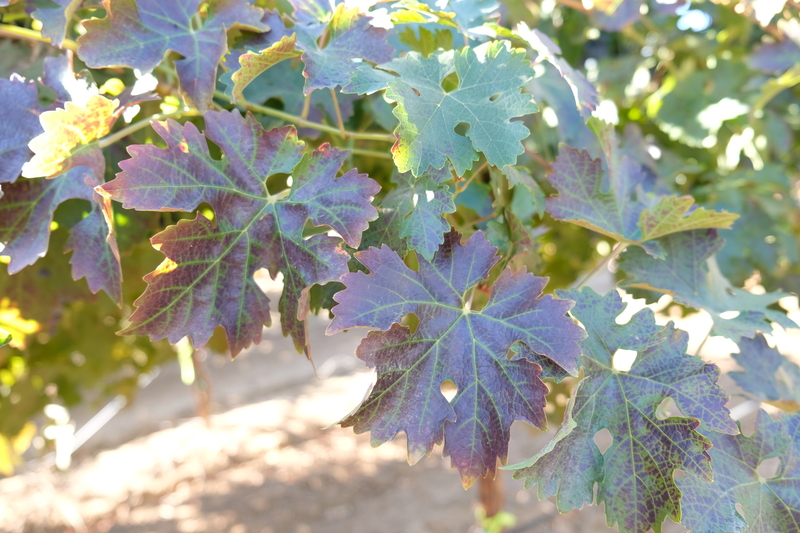 The upcoming Lodi Mealybug & Virus Outreach Meeting will provide timely, relevant information on nursery ordering, the CDFA Grapevine Registration & Certification Program, red blotch virus, leafroll virus, virus management, mealybugs, ants, and replanting after a virus infection. This workshop is the result of intense studies by Lodi’s Mealybug Biocontrol and Grapevine Virus Research Focus Groups comprised of volunteer growers, PCAs, scientists, extension personnel, and industry leaders who gather monthly to discuss short and long term strategies to solve our mealybug & virus challenges. Held at the Cabral Ag Center in Stockton, you’ll learn real-world management tips from special guests Prof. Gerhard Pietersen (leafroll virus expert, University of Stellenbosch, South Africa), Dr. Marc Fuchs (virus expert, Cornell University), Dr. Kent Daane (vine mealybug expert, UCCE), and Dr. James Stamp (planting material quality expert, Stamp Associates). Attendees will have time to interact with virus testing labs, nurseries, USDA TAP, and mealybug biocontrol companies (including a new drone beetle release company). It’s imperative that everyone in our industry – growers, PCAs, nurseries, laboratories, wineries, lawmakers, & more – are EDUCATED about the virus situation so that we can continue to produce profitable, quality winegrapes in California. Suterra will pass out FREE mealybug traps to attendees with instructions on how to use them. Vines infected by leafroll virus. 8:45 – 9:00am: CONTINUING EDUCATION CREDITS (DPR & CCA) SIGN-IN. 9:00 – 9:15am: WELCOME & VIRUS OUTREACH PROJECT. 9:15 – 9:45am: VINE MEALYBUGS. 10:20 – 10:30am: COFFEE & NETWORKING BREAK. 10:30 – 11:20am: LEAFROLL VIRUS MANAGEMENT. 11:20 – 11:45am: PLANTING MATERIAL. 11:45 – 12:05pm: OPEN Q&A SESSION. 12:05 – 12:10pm: CLOSING REMARKS & TAKE-HOME MESSAGES. 12:10 – 12:30pm: BREAK OUT SESSIONS with the pros. For more info: Contact Stephanie Bolton at stephanie@lodiwine.com. Please RSVP to Christina at the Lodi Winegrape Commission: 209.367.4727 or lwwc@lodiwine.com. 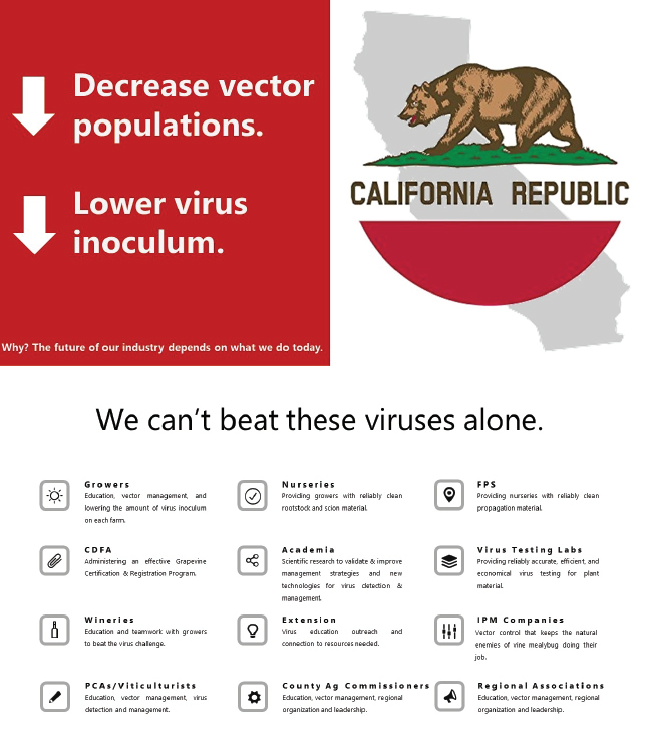 A visual representation of the overall virus strategy for California to guide the outreach initiatives of the Virus Focus Group. Created by Dr. Stephanie Bolton for the 2018 Mealybug & Virus Outreach Meeting. To join the Lodi Growers email list, send an email to stephanie@lodiwine.com with the subject “grower email subscribe” or click on “join our email list” to the right.